Ohhh, let's see about 6 years ago I saw a quilt very similar to this one in a very popular home decorator catalog for major bucks. 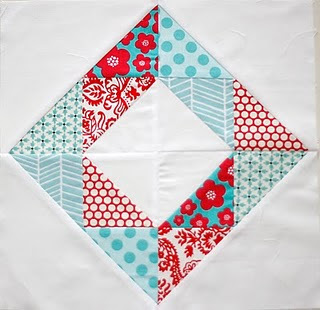 This is such an easy peasy and super inexpensive quilt to make. I wanted to make mine bright and a bit color controlled (i think I failed on that aspect). I shopped around for a variety of bandanas. I probably paid about .99 cents for each one. Sometimes I found some that were 2 for $1.99. It spent many years in my screened porch. It has faded a bit, but it is soft and has held up wonderfully. I simply sliced off the teeny tiny rolled hem on each square and then stitched them together.